It is now June and the classic flower of the month in England is usually considered to be the rose. Apart from the fact that I still have endless weekends of internal decoration to attend to, and, as I type, I am manfully ignoring one entire room left in an almost derelict state, I have started to think about the garden. I realise one way and another I have missed this year for some of my flowering favourites such as the hellebores, tulips, aquilegias, irises and roses not to mention a flowering fruit tree or two. However, now is not the time to moan, but to get on and get planning. It is a good time to think ahead as although quite a few container grown roses are now out of stock for this season, they can still be ordered for delivery as bare root plants for this coming autumn and winter. Naturally, recent evenings have been spent perusing my old copy of ‘The Graham Stuart Thomas Rose Book’ in the hunt for suitable roses for very small gardens. Although I do love many of the old fashioned shrub roses that I have grown in the past not all of them are as robust as some of the more recent introductions such as rosa Queen Elizabeth (1954, see below) or the David Austin rose, rosa St Swithun (1993, above right). 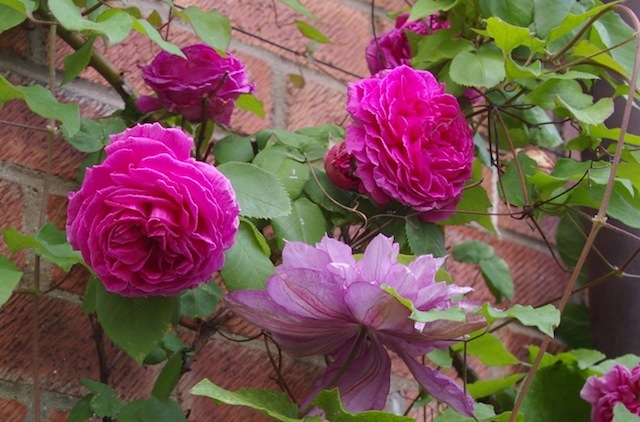 Currently, I am tending towards a thornless, reliable modern climber for my very tiny front patch, possibly the David Austin climbing rose, rosa Mortimer Sackler (2002). It needs to be thornless as it will eventually top the boundary wall at waist height between my property and a side passage used as the rear access for my neighbours. Mind you I have been tempted by Stuart Thomas’s comments on rosa Agnes, “Unusual with delicious scent”, but despite the appealing name (😉) I don’t feel I can fit a yellow rose, even this pale, muddled beauty, into the planting scheme. It is a while since I have taken my copy of the Rose Book off the shelf. Indeed, it has been boxed up with all the rest of my books for the last 18 months during the moving process and consequently I was surprised when a slip of paper fell out. As I picked it up expecting it to be a now redundant list of roses from my last garden, I noticed with curiosity that it was a poem. One of my favourites originally copied out over 15 years ago. When folk consider flowers for Valentine’s Day, the perennial favourite is the red rose. I think there is something intensely romantic about a single, velvety, dark red rose, but if I were to be receiving a bouquet of roses, I think I would prefer pink roses. The bonus with giving or receiving roses is many are fragrant too, with most of the old fashioned varieties perfuming a whole room with their beautiful, rich scent. 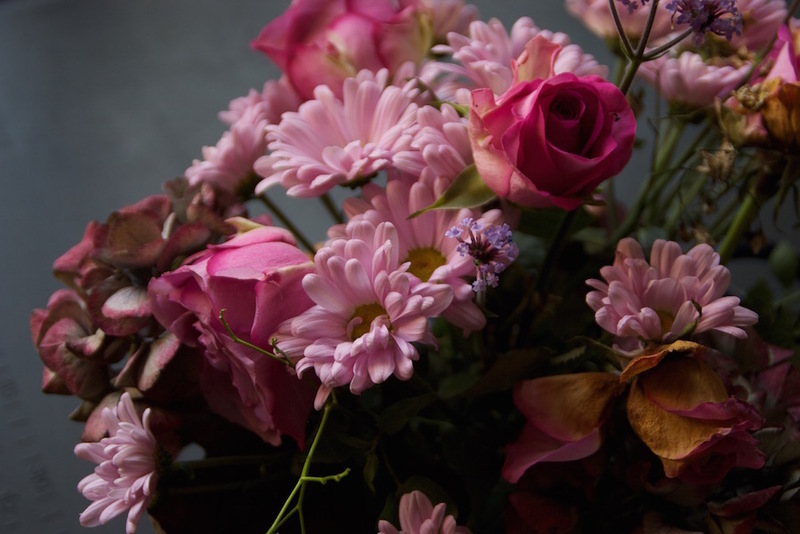 Of course, as you may have already guessed, I don’t just love old fashioned pink roses, but pink blooms in general and find them a great source of inspiration for my flowery silk scarf designs. And with that in mind, here’s a jug of last summer’s dahlias providing just such stimulus! Times are a little turbulent and it’s been a grey summer so far, but some flowers are doing just fine. Hardy geraniums, single clematis, small spray roses, foxgloves and poppies. Beautiful flowers in the garden, as arrangements or simply as a single bloom bring some cheer to our daily grind. Although I have been moaning about the English weather in previous posts, I have had enough survivors by the beginning of July for two mantlepiece arrangements. Gardening is all about the turning of the seasons. Clear, bright spring changing to warm and sunny summer, but sometimes the seasons simply won’t play the game. Apparently, this ghastly, unseasonably heavy June rain is down to the jet stream. That is the jet stream is not normally directly above the UK at this time of year, but HERE IT IS. We see it whipping round the world at over 100 miles per hour somewhere in the region of eight miles plus above the planet’s surface. It affects the UK by deepening the depressions heading our way from the Atlantic and that means more rain. All this rain has caught most of my roses at precisely the wrong moment. Of the old fashioned roses the small cluster and single roses are coping a little better than their more blousy, fully quartered cousins. Luckily, I do have a few climbers threaded through large shrubs which have offered some blooms protection from the hail and heavy rain we had last week. It’s been a bit hit and miss with a couple of my more modern roses depending on how exposed the flowers have been more than anything. Even my favourite soft, papery single rose Anemone Rose has been disappointing. So, looking on the bright side we have some survivors and a weekend of deadheading! Rosa Debutante (1902) Small regrowth after a total collapse a couple of years ago so glad I never got round to digging it out!! This year’s favourite is a ‘summer only’ display and will be in full flower in July, but here’s a peak at a random early bloom of François Juranville (1906). Suburbia gets a mixed press, and ‘suburban’ (at least in the UK) is frequently thrown around as an insult. It can mean average, boring, pedestrian to restrained, uptight and limited. In gardening terms the heyday of the suburban garden was surely the fifties and sixties where neat rectangular lawns were edged with three flower-filled boundary borders. Hybrid tea and floribunda roses were popular for the summer along with bright vivid dahlias and then in the autumn chrysanthemums took over to bring some uplifting colour. Of course, plants are plants and not in themselves suburban, and who cannot fail to love a classic pink rose or a blue mophead hydrangea. And, I’ve even found a style of flower arrangement that I like which works with the standard supermarket/garage forecourt spray chrysanthemums.
. . . so much so that I’ve used the palette for some scarves. Oh yes, and finally, through the ether I’m informed by email and adverts that a festival called Christmas is on the horizon – UKHandmade has just published their Christmas Showcase featuring all kinds of handmade work including a stunning Christmas stocking embroidered by a lady who used to work at Buckingham Palace! 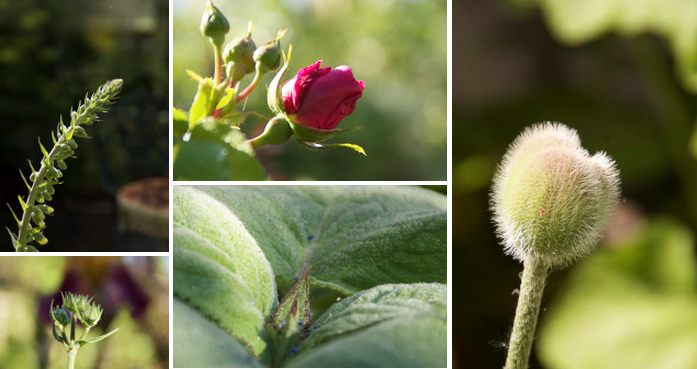 Here is the group of five plants that were in bud at the beginning of June. Now two weeks of early summer sun and light rain and . . . we now have the foxgloves out. And the Oriental poppies, pink roses and the knautia. The garden is full of daisies. However, we’ve to wait a little for the salvia and then much later for the hollyhocks. But time is marching on and it’s almost time to start clearing away the euphorbia bracts after all the seeds have popped out. 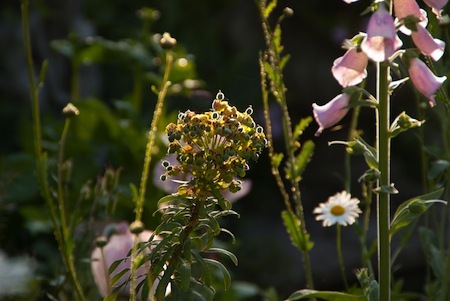 Recently, we might have experienced unseasonably cool weather across East Anglia, but there’s still been plenty of blooming flowers in the garden to brighten the first weekend of June. 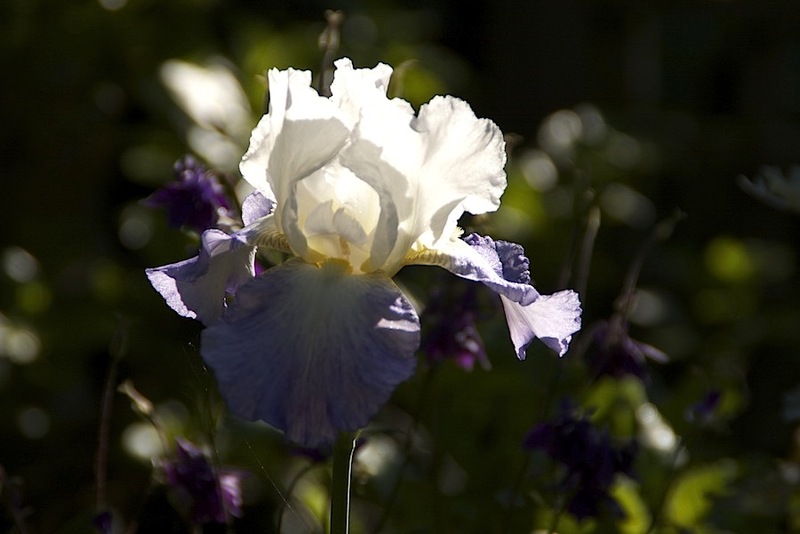 Some of the irises, aquilegias and early summer roses are in full glory. A few stragglers from May are graciously fading away. But, wait a minute, there’s all this potential just about to burst forth! 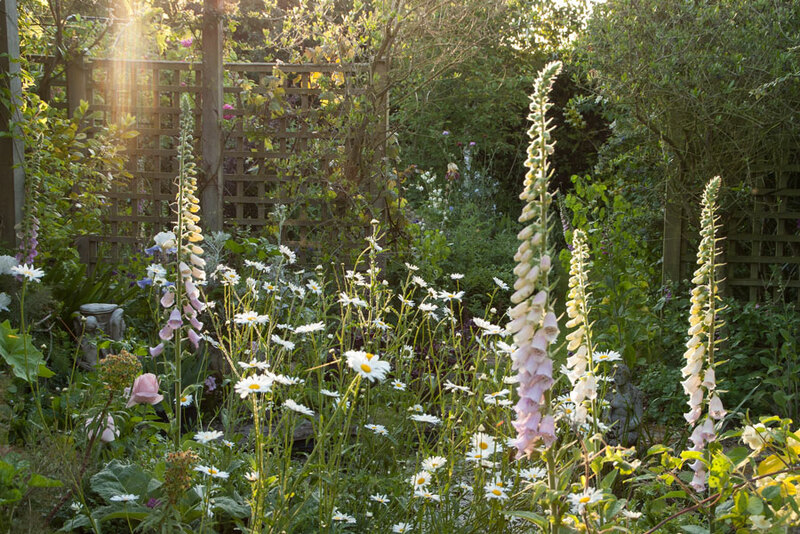 June in an English country garden (well, actually a suburban back garden with cottage style planting) can be a quietly charming moment – weather permitting! Time to fill the gap – a summer rambler perhaps? 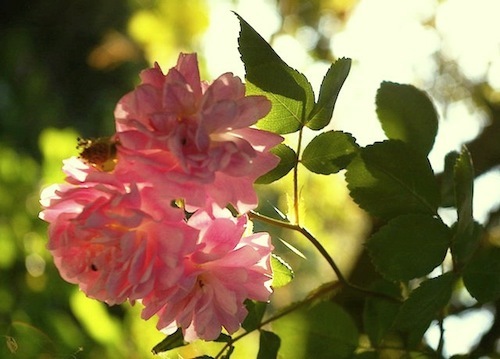 It is definitive – after a year’s grace my beautiful old climbing rose is definitely dead. Last weekend I spent a few hours cutting down and removing the old skeleton of tangled lifeless branches. This winter’s tidy up has revealed quite a gap on the east end of the pergola and dividing trellis. Rosa Debutante in full glory in the summer of 2013. Winter 2015 and the dead rose has left quite a gap. Initially I had been considering another pink rose planted away from the site of the dead rose, but still trailing up over the pergola. There are hundreds of pink roses to choose from and it is a case of deciding what qualities I would like such as colour, scent, length of flowering period, height and possible hip production. And, also very importantly whether the rose will tolerate my impoverished, free-draining soil and low rainfall. But another pink rose? Striking with strong magenta, fuchsia and paler pink stripes. Rosa Ferdinand Pichard. Perhaps not pink then. How about a white rose (the neighbouring wisteria is white) or even a pale yellow? Repeat flowering, reliable, gorgeous scent. Rosa Alister Stella Gray. Of course, also, what about hips too for the autumn and winter months? Also good hips from the wild dog rose, Rosa canina, but growth is too wild and natural for a pergola. Medium sized hips on Rosa Alister Stella Gray. But having a good think and looking again at some of my favourite colour combinations. And, I think that the peachy apricot colour I’m looking for could be this rose, rosa François Juranville. It was first introduced in 1906 and as it is a Wichurana Rambler it will only flower once in mid-summer, but within a few years that should make a spectacular display for July. 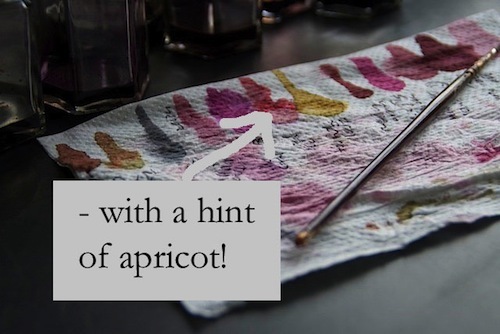 It’s the colour and scent that wins the day! 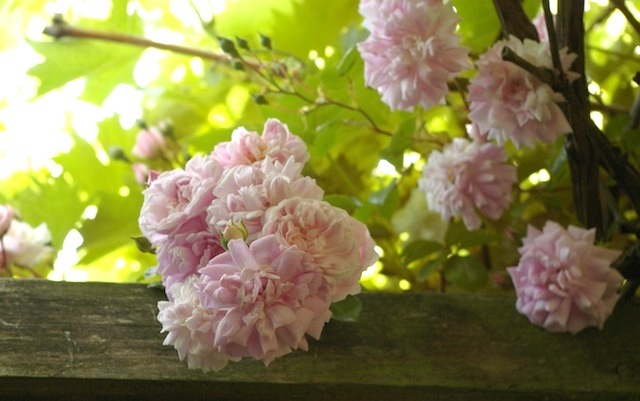 Sprays of scented double flowers, rosa François Juranville. 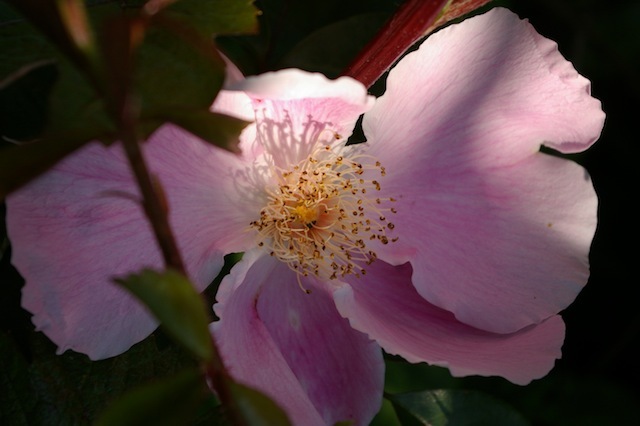 Author agnesashePosted on February 19, 2015 Categories Flowers, GardensTags Blossom, Flower, Gardening, hips, old rose, pergola, pink, ramblers, rosa François Juranville, Rose, roses, summer, wichurana rambler4 Comments on Time to fill the gap – a summer rambler perhaps? This is one tough and beautiful rose which I bought from Peter Beales Roses when I returned to Norfolk 10 years ago. I think it might be my favourite rose. It is Rosa Anemone, a Hybrid Laevigata. 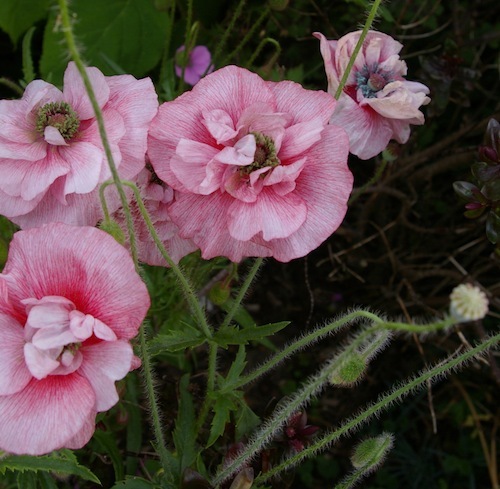 From June onwards it has large, single silver-pink flowers and according to the catalogue has ‘a touch of mauve giving it a vaguely oriental look’. It is quite a thorny rose, but as each open flower is so charming and delicate it’s worth putting up with a few prickles, plus, the single blooms are very popular with bees and other insects. You can place an order for bare root roses throughout the year, but the rose growers start digging them up and despatching them from this month until March. I like to buy bare root roses because I’ve always received roses with a much better root system than those grown as container specimens. But the main reason I buy bare root from a specialist grower is you get an enormous and varied selection to choose from. Classic plant combination, roses and clematis. Rosa Mme. Isaac Pereire and Clematis Proteus. Having recently taken down an overgrown peach tree I’m looking for a small climbing rose, pale to mid-pink that will cope with poor, stony soil and tolerate a little shade. Haven’t made my mind up yet, but it’s always important to remember what else will be flowering near it at the same time. These pink Shirley poppies were out in late June this year so a handful of seeds in the vicinity of a new rose just might be a combination to work towards.